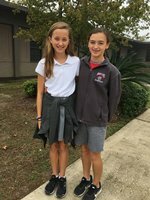 Congratulations to Josie McDonald and Annalee Parks for qualifying for State in the cross country competition. With a time of 23 minutes and 15 seconds, Josie was the first lady Spartan to cross the finish line, finishing 20th overall. Annalee Parks was not far behind with a time of 25 minutes and 34 seconds. Both of these seventh graders were competing against high school runners and still qualified for State. Way to go, ladies!